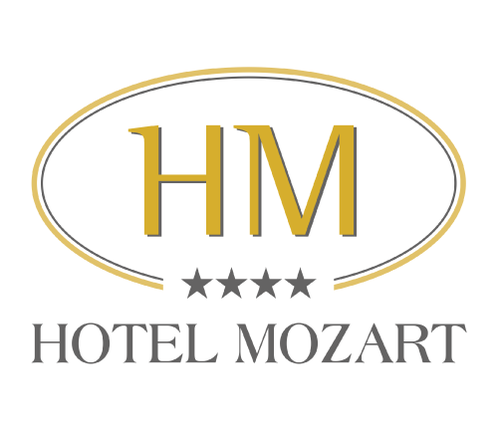 Classic sophistication merges with contemporary comfort at 4-star Hotel Mozart Milan. 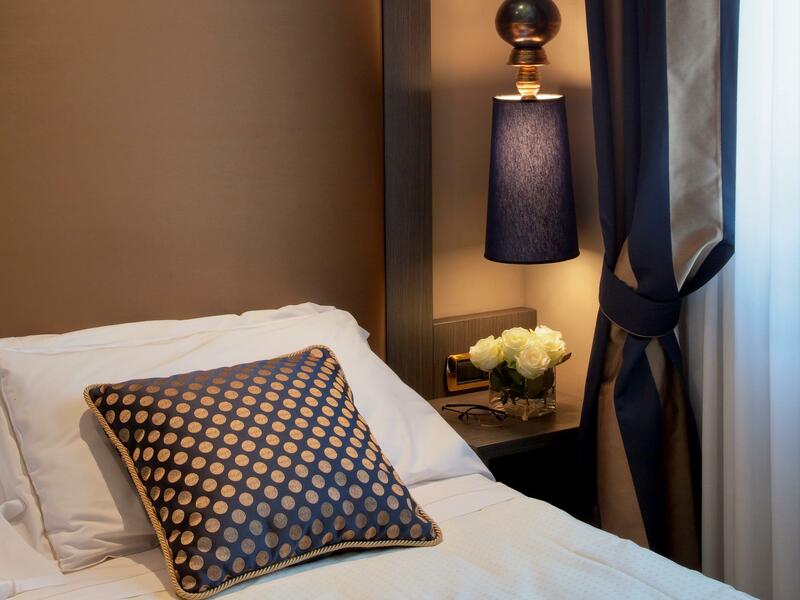 In the heart of the city centre, step into one of 119 beautifully appointed Milan hotel rooms and suites designed to meet the needs of today’s business and holiday traveller. 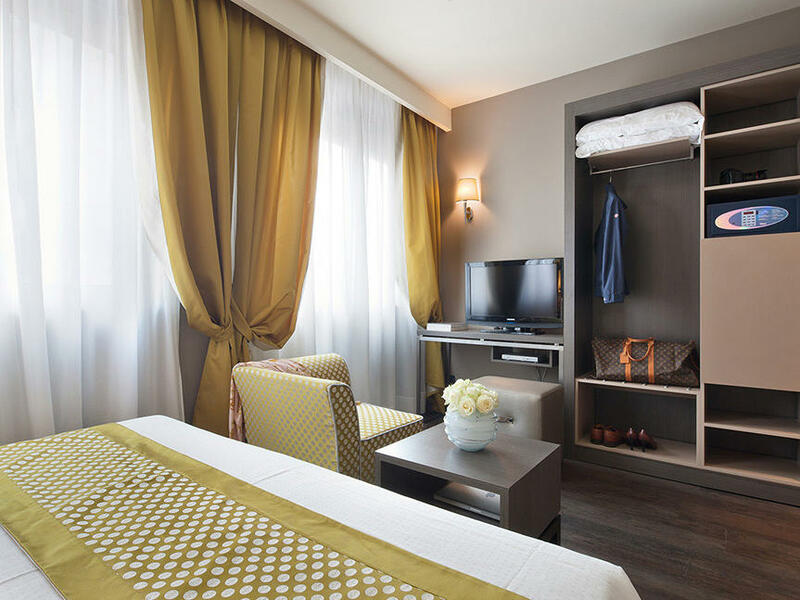 Boasting views of sunny Piazza Gerusalemme or peaceful Via Mussi and the hotel’s internal courtyard, all our Milan hotel accommodation is warmly decorated with elegant furnishings, fabrics and colour palettes and comforts like air conditioning, satellite and pay-per-view TV, a minibar and Wi-Fi access. 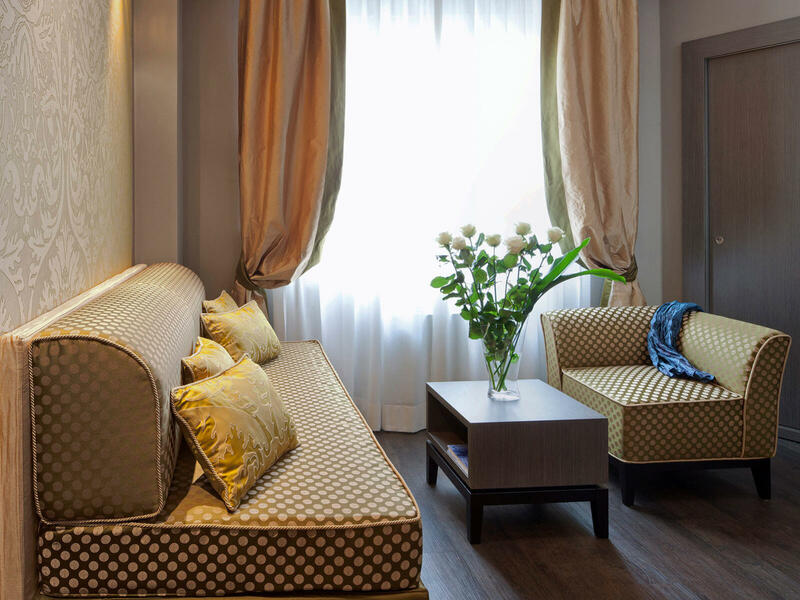 Families, groups and business guests in need of additional space and privacy will enjoy our suites, which feature walls adorned with high-end fabrics, plaster friezes, frescoed ceilings and Jacuzzi equipped bathrooms. Warm and stylishly furnished, our Single Classic is well equipped with air conditioning, satellite TV, safety box (suitable for laptop), minibar and complimentary Wi-Fi connection. 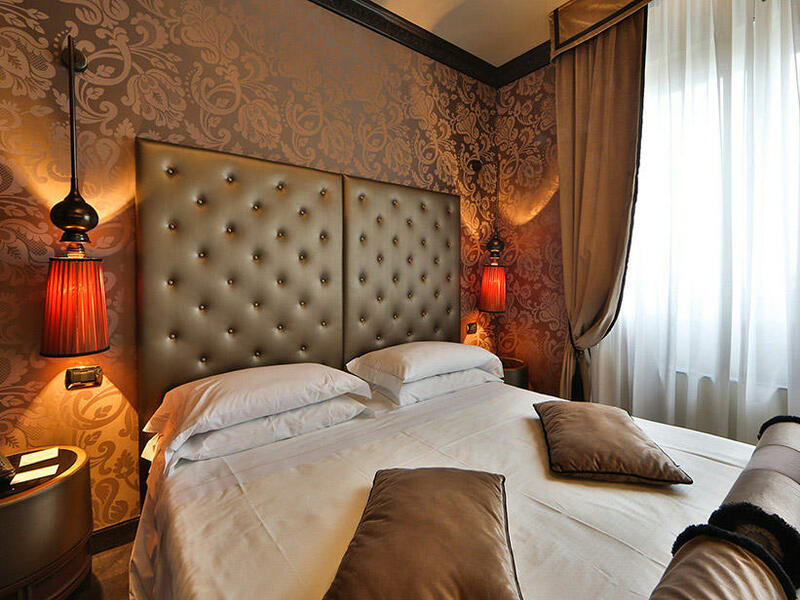 Additional comforts include a bathroom with a shower and a plush 100-centimetre Simmons bed with deluxe, high-thread count Italian linens. Warm and tastefully furnished, our recently renovated Single Superior is well equipped with air conditioning, satellite TV, safety box (suitable for laptop), a minibar, complimentary Wi-Fi and free toiletries, including slippers and bathrobe. Additional comforts feature a bathroom with a shower and a plush 120-centimetre Simmons bed with deluxe, high-thread count Italian linens. 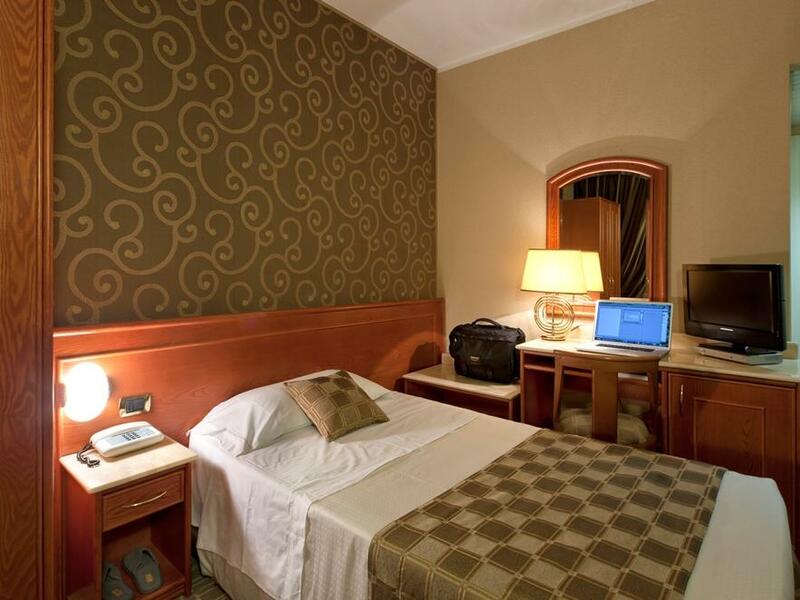 Warm and stylishly furnished, our Double Classic Single Use is well equipped with air conditioning, satellite TV, safety box (suitable for laptop), a minibar, complimentary Wi-Fi. Additional comforts feature a bathroom with a shower and a plush 140-centimetre Simmons bed with deluxe, high-thread count Italian linens. Warm and tastefully furnished, our recently renovated Double Superior Single Use is well equipped with air conditioning, satellite TV, safety box (suitable for laptop), a minibar, complimentary Wi-Fi and free toiletries, including slippers and bathrobe. Additional comforts feature a bathroom with a shower and a plush 160-centimetre Simmons bed with deluxe, high-thread count Italian linens. 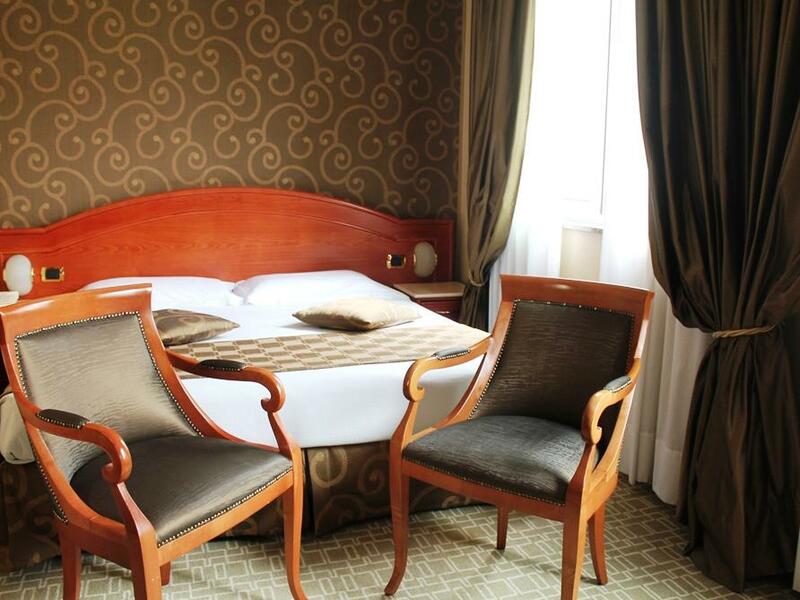 Warm and stylishly furnished, our Twin Classic is well equipped with air conditioning, a 32-inch flat-screen satellite TV, a safety box (suitable for laptop), a minibar, complimentary Wi-Fi. 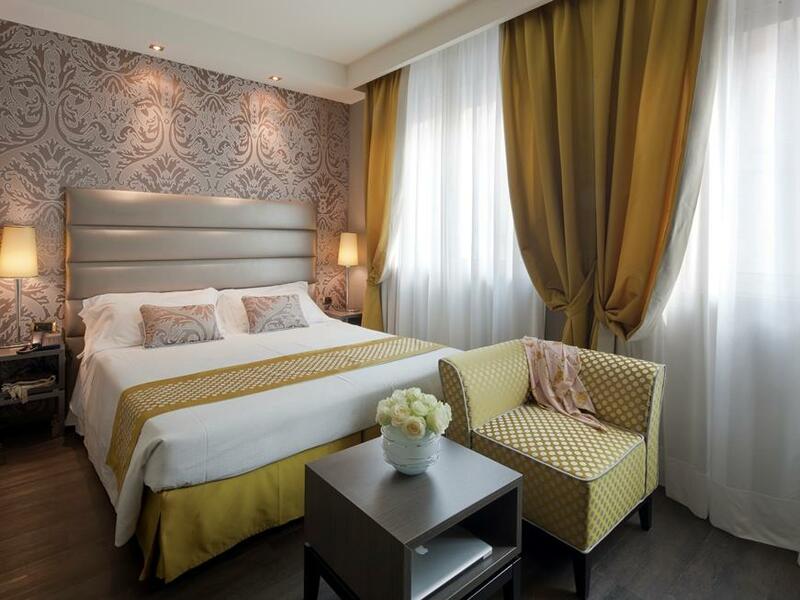 Additional comforts feature a bathroom with a shower and two plush 90-centimetre Simmons beds with deluxe, high-thread count Italian linens. Warm and tastefully furnished, our recently renovated Twin Superior is well equipped with air conditioning, a 40-inch flat-screen satellite TV, safety box (suitable for laptop), a minibar, complimentary Wi-Fi and free toiletries, including bathrobe and slippers. 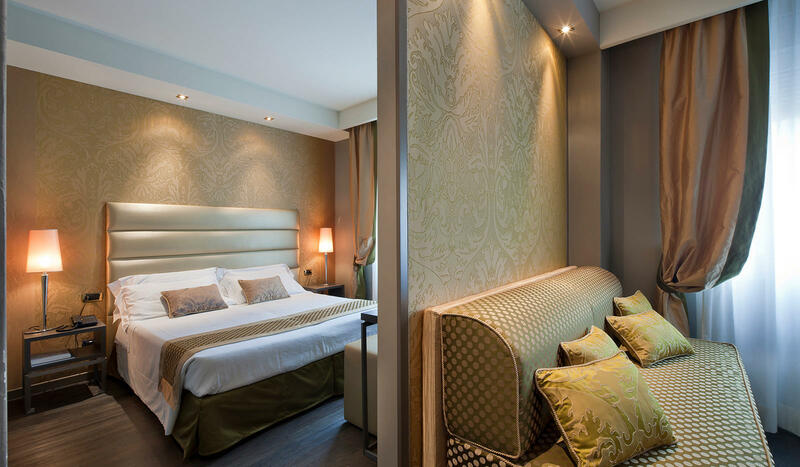 Additional comforts feature a bathroom with a shower and two plush 100-centimetre Simmons beds with deluxe, high-thread count Italian linens. 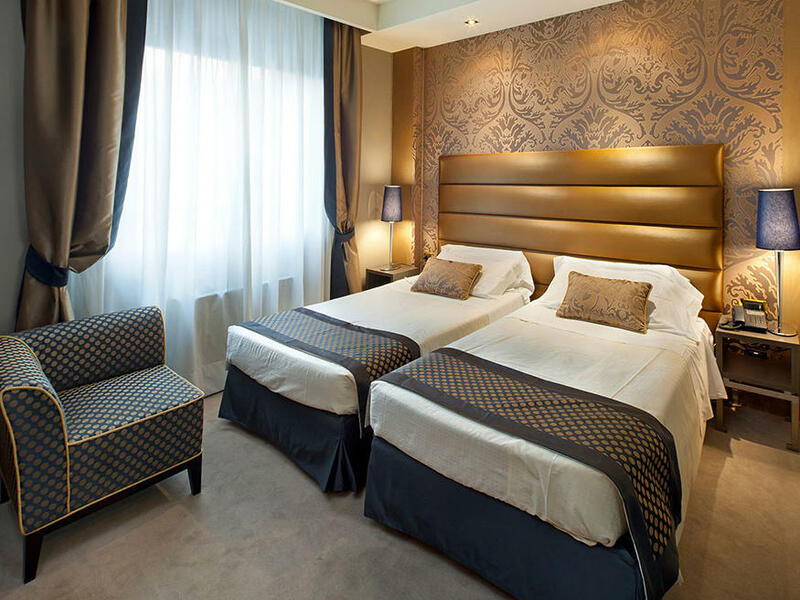 Warm and tastefully furnished, our recently renovated Double Superior is well equipped with air conditioning, a 40-inch flat-screen satellite TV, safety box (suitable for laptop), a minibar, complimentary Wi-Fi and free toiletries, including bathrobe and slippers. 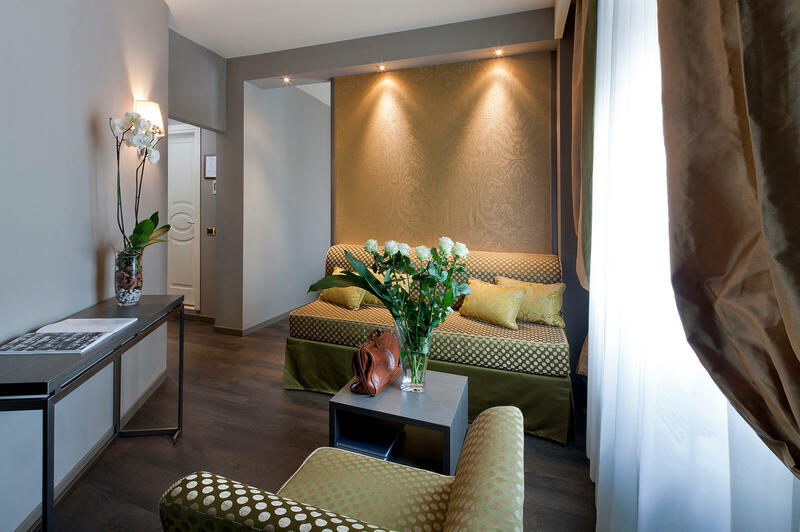 Additional comforts feature a bathroom with a shower or a bathtub and one plush 180-centimetre Simmons bed with deluxe, high-thread count Italian linens. 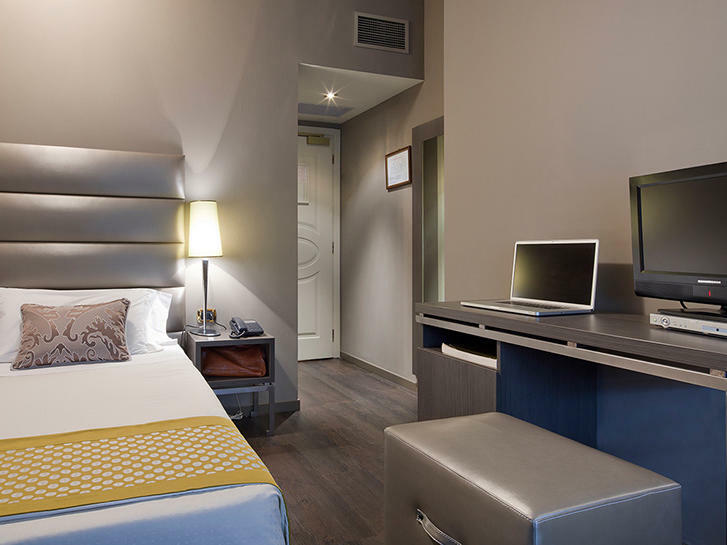 Warm and tastefully furnished, our recently renovated Triple Superior is well equipped with air conditioning, a 40-inch flat-screen satellite TV, safety box (suitable for laptop), a minibar, complimentary Wi-Fi and free toiletries, including bathrobe and slippers. 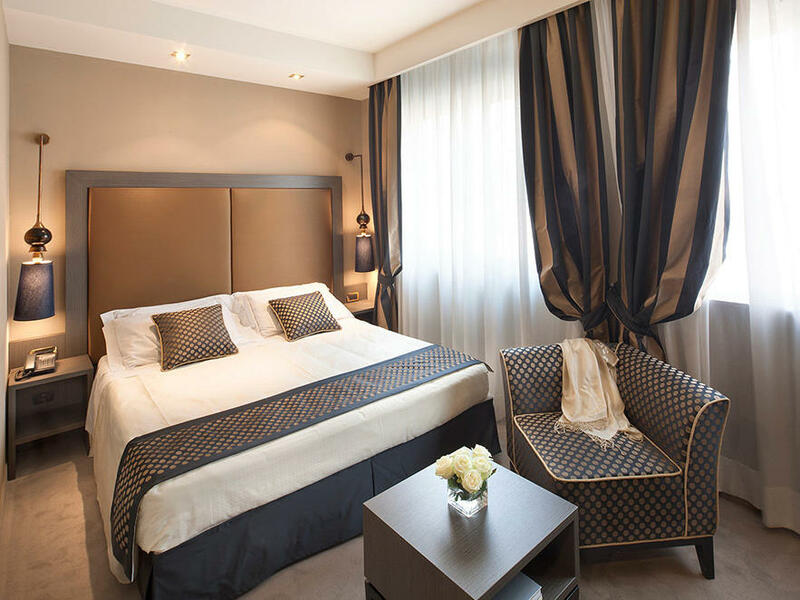 Additional comforts feature a bathroom with a shower and one plush 160-centimetre Simmons bed and one 90-centimetre Simmons bed with deluxe, high-thread count Italian linens. 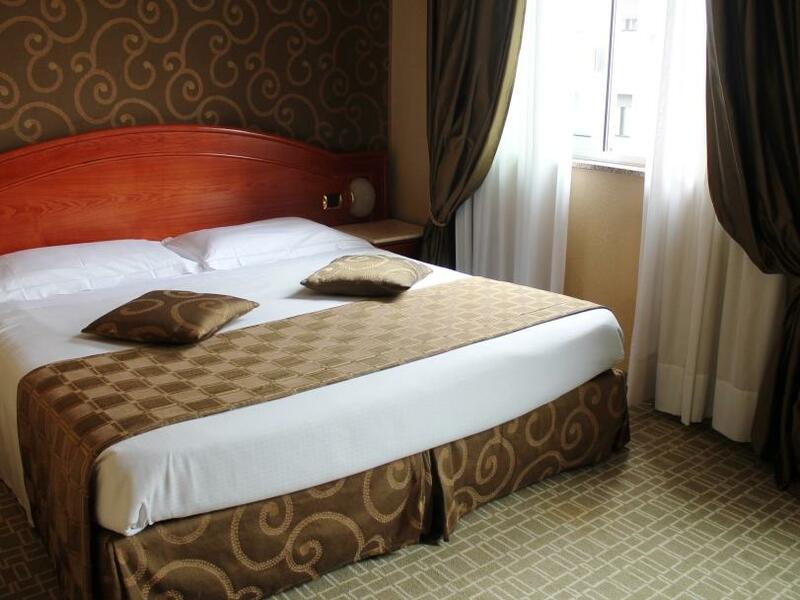 Located on the 6th floor, these rooms are also equipped with a private balcony. Embellished with fine fabrics and superior upholstery, our elegantly decorated Deluxe Rooms are characterised by a particularly pleasant view. All are well equipped with air conditioning, a 40-inch flat-screen satellite TV, safety box (suitable for laptop), a minibar, complimentary Wi-Fi and free toiletries, including bathrobes and slippers. 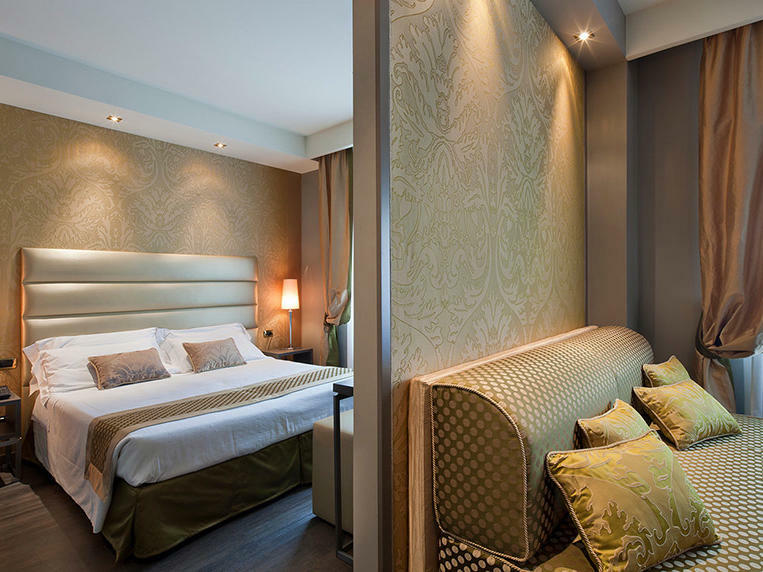 Additional comforts feature a bathroom with a shower and one plush 180- to 200-centimetre Simmons bed with deluxe, high-thread count Italian linens.